FRANK To, the Glasgow-based artist with an emerging international reputation as a leading contemporary figurative painter, is urging fellow artists to go back to the future to relearn the art of business and the business of art. Observing that the recession has affected artists in terms of sales and funding, To has opted instead to engage directly with the business and financial communities by taking a very old business strategy and incorporating it into today’s world. “The House of Medici, the political dynasty that first began to gather prominence in Florence during the late 14th century and went on to found the Medici Bank also fostered and inspired the birth of the Italian Renaissance,” said To. “The Medici were responsible for the majority of Florentine art during their reign, including Botticello and Michelangelo, who produced work for a number of Medici, such as Lorenzo the Magnificent (who also served as patron to Leonardo da Vinci). “The business model I adopt as an artist today, is essentially the same used by the illustrious artists sponsored by the Medici. Indeed, the reason why we know about these artists today is because Vasari, whose writings about them are considered the ideological foundation of art-historical writing, was sponsored by the Medici. “During the renaissance, there were no shops or galleries within which artists could exhibit and sell their work. Rather, they had to learn the arts of marketing and promotion to develop a reputation and credibility to attract attention from the likes of Vasari. And just as the giants of the renaissance had the Medici Bank on their side, To’s latest exhibition is supported by RBS. “Similarly, just as the renaissance artists painted murals across the walls and ceilings of chapels and churches to tell their story, I have adopted the same concept, though applied to the digital age,” he said. “I am currently telling the story of Dante’s Divine Comedy, the subject of my latest exhibition, on the social media platform KILTR where I upload images from the show on a daily basis. 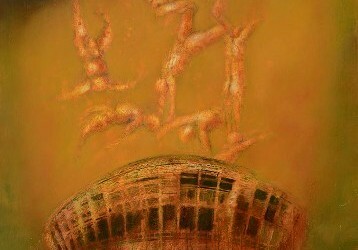 Frank To’s new exhibition, Dante’s Divine Comedy, is at The Leith Gallery till 27th April with support from RBS. The exhibition comprises 33 works in total, with 25 paintings and eight fine art mono prints, ranging in price from £250 to £4500. Born in Falkirk in 1982, To graduated from the University of Huddersfield with a BA (Hons) Fine Art before going on to gain a Masters of Fine Art from Duncan of Jordanstone Art College where his tutor was Calum Colvin. In recent years, he has exhibited alongside some of the greats of the international art scene, including Banksy, Jimmy Choo and Antony Gormley.